Leo Finn with son Cash. Finn had a bone scan canceled at Dana-Farber. A Cape Cod man’s last-chance treatment for cancer has been postponed by the government shutdown because new clinical trials cannot begin until they are registered on a federal website, which has been forced to stop processing applications. 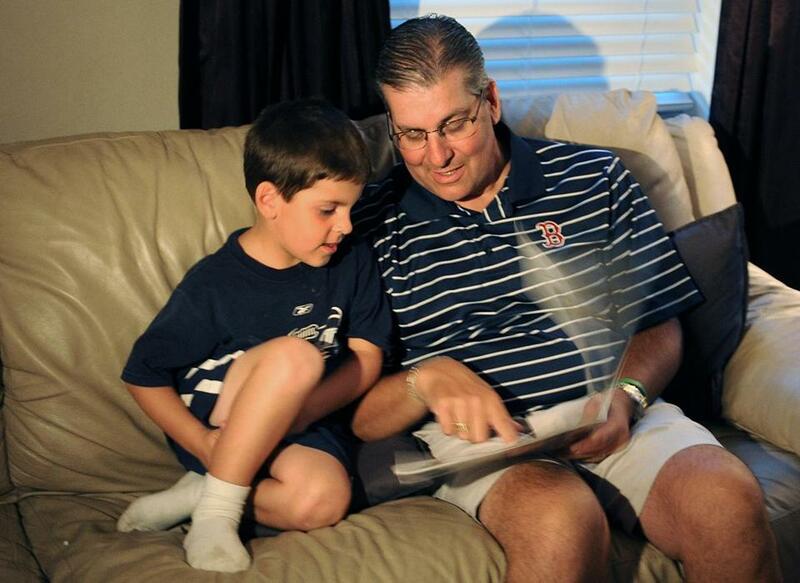 Leo Finn said he had his bone scan canceled at Dana-Farber Cancer Institute in Boston Wednesday, and the 48-year-old father of three is now unlikely to receive an experimental drug for his metastatic bile duct cancer next month as he had expected. As the government shutdown reaches its third day Thursday, Finn’s plight highlights the concern among hospital officials and scientists in the Boston area that it could eventually have a far-reaching impact on patients and research. Finn said he was diagnosed with terminal cancer in February, after tumors had spread to his liver and bones. At first, doctors tried standard chemotherapy drugs, but they shrank his tumors for only a short time. His Dana-Farber oncologist recommended that he try cabozantinib, a drug approved for thyroid cancer but still experimental to treat other cancers. But before he could get the drug, the hospital had to launch a clinical trial, because no other patients with his type of cancer are receiving it. But the registration website, www.clinicaltrials.gov, is not able to process new requests. Dana-Farber officials said they could not speak about a specific patient, but they said staff met Wednesday to review the files of patients expected to be treated in research studies over the next few weeks and confirmed they had found one patient whose treatment would have to be postponed. “As best we know at the current time, this is the only [patient],” said Dr. Bruce Johnson, chief clinical research officer at Dana-Farber. Finn’s case appears not to be an isolated example. National Institutes of Health director Francis Collins told the Associated Press that each week the shutdown continues, the NIH hospital in Bethesda, Md., will have to turn away 200 patients, 30 of them children, seeking to enroll in studies, often for last-resort treatments after they have exhausted all other options. Officials fear other consequences. Biomedical researchers may experience delays in having their pending grants approved. The NIH had to cancel grant review panels this week at the institutes’ headquarters in Maryland. Rescheduling these panels — involving more than a dozen researchers scattered nationwide — might not happen for months. Other hospital researchers are nervous about an NIH grant application deadline Monday. Any delay in processing these submissions could leave labs without federal funding for an indefinite period and could delay projects. When combined with threatened funding cuts because of the federal sequester that began earlier in the year, Michel said, he has never seen such “grim circumstances,” which threaten to drive young biomedical scientists into other fields. “We’re getting closer and closer to the brink,” he added. Dana-Farber has been closely reviewing chemotherapy drug shipments the hospital receives from a pharmacy at NIH. While the supplies have not dwindled so far, Johnson said the research pharmacist at the hospital has been trying to prepare for possible shortages. “We’re in the midst of trying to identify all the pressure points that could affect our research or patient care,” he added. With the official start of the flu season this week, the Centers for Disease Control and Prevention will not be tracking the viruses spread through cities and states while the government is shut down. Two-thirds of the CDC’s employees, about 8,000 workers, have been furloughed. That also means less staffing to investigate culprits causing food-borne illnesses and other infectious diseases. While VA and military hospitals will remain open, certain services will not be available. Rehabilitation benefits will not be processed, and if the shutdown lasts for more than a few weeks, the Department of Veterans Affairs will run out of money to pay disability claims and pensions, which could affect more than 3 million veterans. While inpatient and emergency services will continue without disruption, patients will experience delays in scheduling new appointments and should contact their doctors to make sure previously scheduled appointments will be kept, the statement said. Deborah Kotz can be reached at dkotz@globe.com. Follow her on Twitter @debkotz2.